Tourism operators in the Top End are increasingly concerned about gamba grass, citing fire damage and a rapidly-changing landscape as serious threats to their businesses. The warnings come on the back of concerns from Tourism NT, who recently cautioned the government on any cuts to the ‘Turbocharging Tourism’ marketing program. Rob Woods, owner of tour company Ethical Adventures, said eight years running tours across the Top End had given him a front row view of significant landscape change. “In the last year, it’s become quite apparent we’re starting to see large-scale ecosystem change and big impacts from more destructive fires,” Rob said. “The intensity of massive fires in the Top End is already having an impact on our business. In Litchfield National Park, we’ve lost a lot of the big trees around the cathedral termite mounds. “We’ve also noticed a significant decline in mammals across the landscape. If you come out at night now, I guarantee you’re not going to see the same number of animals as you would have 15 years ago. Mitch Hart from The Pew Charitable Trusts highlighted the economic impacts of gamba grass in a recently released a report by the Gamba Grass Roots alliance. “Rob’s story is one of many,” he said. “Bring all those pieces together and you start to see the full impact of gamba on our landscape. It’s here, it’s dangerous and unless we act soon, it’s going to get a whole lot worse. “We’re proud of the Territory’s pristine environment and wildlife and it’s the job of our tourism sector to showcase that. Currently though, we’re failing to protect our natural values which will leave our tourism sector with little to show visitors in the future. “The government needs to do more to fund the fight to stop gamba spreading further across our landscape before it’s too late. 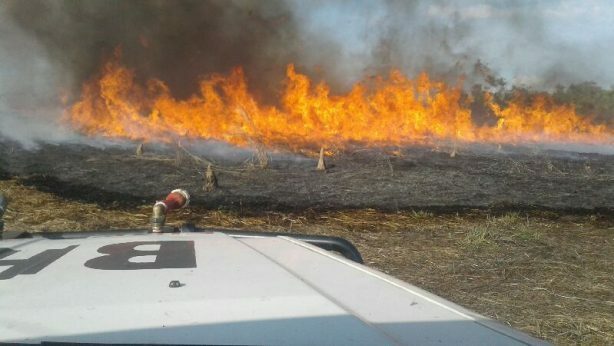 Territorians are already counting the cost of gamba grass infestations through skyrocketing fire management costs putting even more pressure on the Territory Government’s budget.